Official artwork of the King of Red Lions from Wind Waker HD. King of Red Lions (赤獅子の王, King of Red Lions) and the “King of Hyrule” is Toon Link's partner and ship in The Legend of Zelda: The Wind Waker. The King of Red Lions as he appears in Wind Waker. 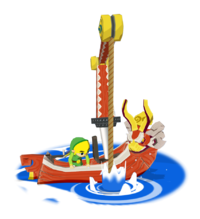 The King of Red Lions is a talking sailboat that first appeared in The Wind Waker. He is actually the king, Daphnes Nohansen Hyrule who was reawaken by the Goddesses to help defeat Ganondorf. 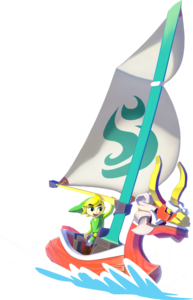 After meeting Link, King of Red Lions helps him to save Hyrule by traveling the Great Sea. In Hyrule Warriors Legends, King Daphnes Nohansen Hyrule is able to transform into the King of Red Lions as part of his moveset. The King of Red Lions behind the Pirate Ship. The King of Red Lions will periodically appear behind the Pirate Ship, acting as a temporary second platform before he sails away. He will disappear once he and the Pirate Ship are taken by the cyclone. The King of Red Lions also appears as a randomly obtained trophy. King of Red Lions Trophy in Brawl. A talking ship that rescues Link when he is thrown out to sea by the Helmaroc King. Rich with knowledge, he is a valuable partner, guiding Link in his adventures. As the ship is without a sail, Link must first acquire one on Windfall Island before venturing out on the Great Sea. It has been revealed that the King of Red Lions is actually the king of Hyrule. The King of Red Lions reappears on the Pirate Ship. The King of Red Lions also reappear as a trophy in the Wii U version. King of Red Lions Trophy in Wii U. The King of Red Lions, as well as his true frorm as the King, appear as Spirits. This page was last edited on March 13, 2019, at 17:54.